Kenya Explorer Safari in 12 days visiting in Tsavo East and West, Amboseli, Aberdare, Samburu, Ol Pejeta, Nakuru and Maasai Mara. If you would like to book this itinerary or you would like to customize this itinerary please make an enquiry. Depart Nairobi at 0700hrs and drive to Tsavo East National Park arriving in time for lunch, afternoon proceed for a game drive in this park that offers a vast and untapped arena of arid bush which is washed by the meandering Galana River. Guarded by the limitless lava reaches of Yatta plateau and patrolled by some of the largest elephant herds in Kenya. Dinner and overnight at Lodge/Camp. Depart after breakfast for Tsavo West National Park. The chief marvel here is the Mzima Springs, replenished with two hundred and twenty million litres of crystal clear water everyday. Mzima Springs is a favorite haunt of hippos and crocodiles. There are well-marked nature trails, an observation platform and an underwater glass tank, which provides a special vantage point to view this remarkable oasis. Arrive in time for lunch at the lodge. An early evening game drive of the park. Return to Lodge/Camp for dinner and overnight stay. After breakfast depart Tsavo for Amboseli National Park , situated at the foot of towering Mt. 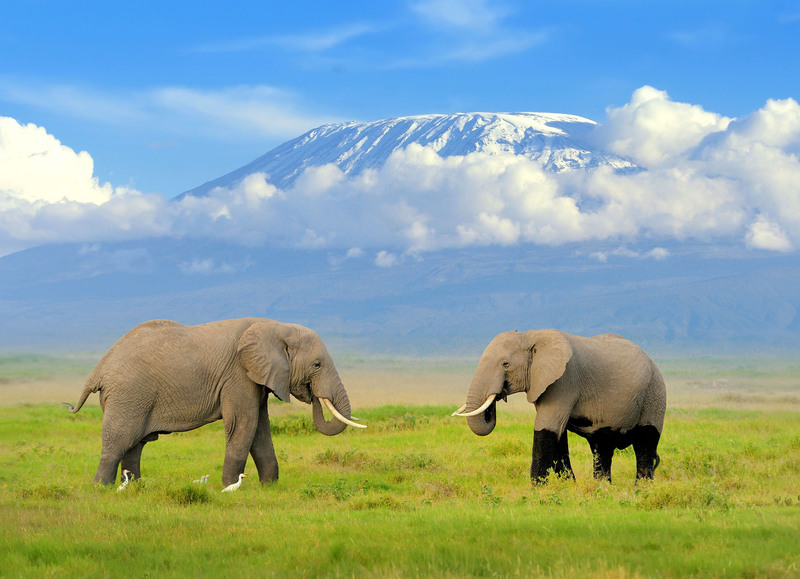 Kilimanjaro (the tallest Mt. in Africa). This park is best known for its abundance of Elephant. Arrival in time for lunch, followed by the early evening game drive. Dinner and overnight at Camp/lodge. Enjoy the thrill of pre-breakfast game drive, an excellent time view game when the snow clad peaks of Mt. Kilimanjaro are at their most spectacular. Early evening game drive includes a visit to the swamps which teem with all sorts of wild life & an amazing assortment of birds. Dinner & overnight at Camp/lodge. After breakfast with picnic lunch depart and drive via Nairobi to Mount Kenya National Park. Arrival in the afternoon proceed on to Serena Mountain lodge (a dramatic wooden lodge) built deep within the forest. The floodlit waterhole & saltlick are in full view from comfortable lounge area, giving guests the chance to watch animals at any time of the night. Elephant, Lion, Buffalo & Rhino are common visitors at the Mountain Lodge. Dinner & overnight at Mountain Lodge. Depart after breakfast and head further north to the dramatic semi-arid scrubland of the northern Frontier “Samburu National Reserve“. After lunch, an afternoon game drive to sight resident wildlife species like the Reticulated Giraffe, Grevy’s Zebra, Beisa Oryx and the blue-necked Somali Ostrich that are rare elsewhere in the country. Dinner and overnight will be spent along the banks of the Uaso Nyiro River at the luxurious Camp/Lodge. Further exploration of this fascinating reserve awaits you. Early morning and afternoon game drives give a chance to travel over some of the world’s most spectacular and exciting terrain. Meals and overnight at the Camp/Lodge. After breakfast drive to Sweetwaters Tented Camp, whose tents face a water hole with the view of Mt. Kenya in the background. An afternoon game drive where you can see the reticulated Giraffe, Buffalo, Oryx, Elephant, and various species of plains game can be seen in this game sanctuary far from the crowds of better known game parks. (Guests can also enjoy the excitement of a night game drive at a little extra directly with the lodge). Dinner & Overnight Camp/Lodge. Depart after breakfast and drive via the Equator line to Lake Nakuru National Park. Arrive in time for lunch, proceed on an early evening game drive, in this beautiful park which boasts Kenya’s first Rhino Sanctuary, home to the rare Black Rhino. Dinner and overnight, lodge/Camp. 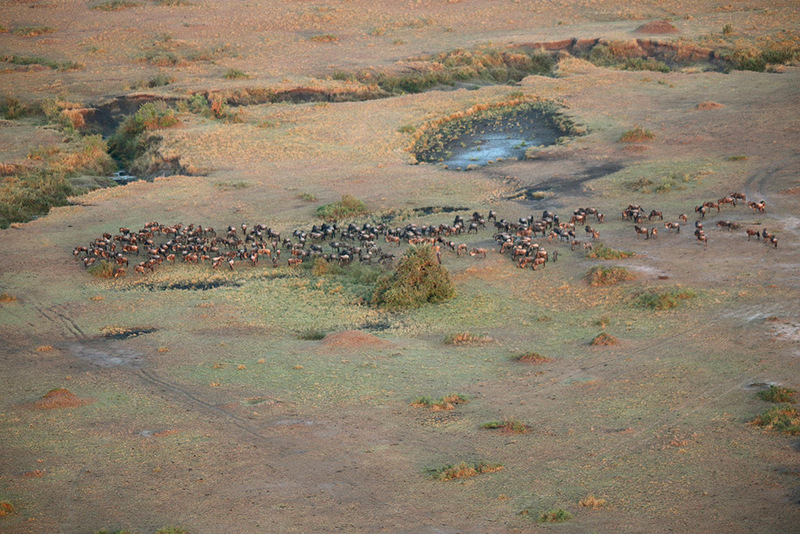 After breakfast depart and drive to Maasai Mara – the land of vast migrating herds. Arrive camp for lunch. In the afternoon, embark on a game drive to get a closer look at the Maasai Mara. Return to the Camp/lodge for dinner and overnight stay. Early morning and evening game drives to absorb the enormity of the Maasai Mara. In this country of breathtaking vistas, view its vast assemblages of plains game together with their associated predators: Buffalo, Black Rhino, Hippopotamus, Leopard, Cheetah, Lion, common zebra, Coke’s Hartebeest, White bearded Gnu, Oribi, Warthog, and Thompson’s and Grant’s Gazelles. Alternatively depart camp with picnic lunch for a full day tour. All meals and overnight stay Camp/lodge. Book / Enquire This Safari.